This route is as flat as it can be for a 600, around 1,700m of climbing with all the "hills" concentrated in the first 60k and the 30k. It is also a exposed route so wind is another factor; but all in all it looked on paper a good route to ride a 600 just 10 weeks after my crash. There were around 150 riders in the event so we were sent off in waves. I was in the second wave. Wanted to be sent as early as possible to get the chance to join one of the trains that inevitably would pass me. And I was lucky, very soon I was sitting in the middle of a bunch or 10 riders riding two abreast and cruising easily through the hills. 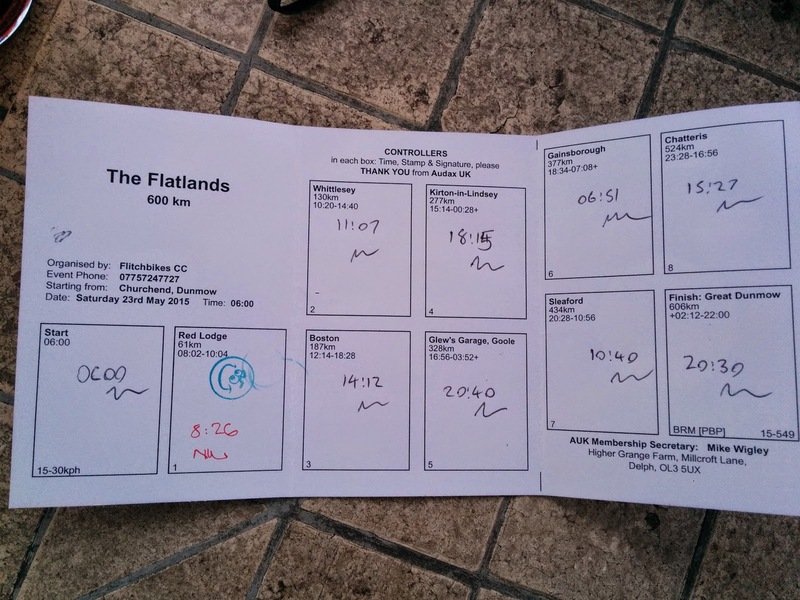 We made it to the first control (km 61) by 8:26. It was a cafe, but it was too early for me to stop for long time so went to the toilet and very quickly I was back on the road, now on my own. It wasn't long until a group of three riders passed me. Two men and a woman they were part of the first group. Soon two more riders joined us and we were six. The pace was a bit faster than the one we were keeping in the first sector but I was happy to push myself, we were riding in the flat against head wind, riding in company and the time saved will be worth the effort. The problem was when we tried to organize some turns in the front. Very quickly the pace went up, to the point that when I was second wheel I couldn't keep up. Moved to the right and slowed down, that was too much for me. Luckily someone else in the group complained and the pace slowed down a bit; but not much, by the time we made it to the second control (km 130) we had lost the two riders and I was hanging on my nails to at the back of those three riders. It was 11:07, I had ridden 130km in 5 hours and I was already tired, time for a quick break. I went back to the road and at some point the three riders passed me again. This time I didn't even try to join them, the pace was one point too hard for me. I saw them disappearing in the flat. But some kilometers later a level crossing and a couple of traffic lights allowed me to join them while they were waiting for the green. There we went again, 20 or so kilometres to make it to the next control, km187. It was 14:12 I've been riding for 8 hours and I was hungry. 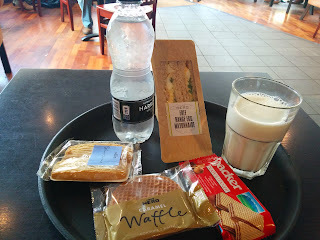 Normally I would carry my own food but I needed to travel as light as possible so I was going to rely on whatever I would find on route. This the selection from a Nero cafe. The history repeated itself, the group of three passed me at some point but I didn't even considered the possibility of joining them, looked to other side pretending I haven't seen them. Luckily we were now having tail wind and despite being really tired I was riding at a decent speed. By the time I made it to the next control (277km) I had gained enough time to consider the idea of stopping to sleep during the night. Called a hotel in Epworth and confirmed a room for that night. If everything went right I would have six or seven hours to recover. 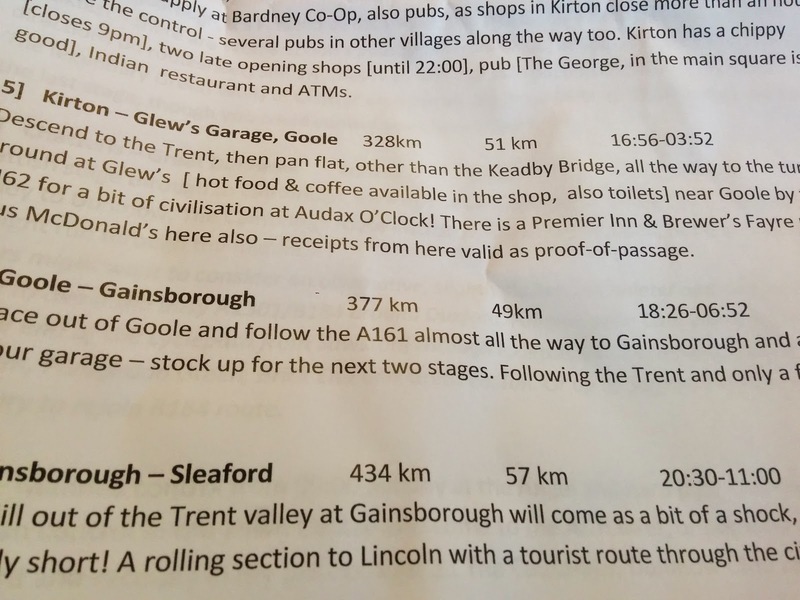 Made it to the control in Goole (km 377) riding with two other cyclist I had met a couple of time in the last two stages. It was 20:40 and I was hungry again so I decided to go McDonals. 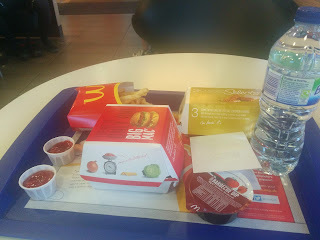 It'd been years since the list time I went to McDonals, but I was hungry, fancy something hot and McDonals is fast serving. By the time I was getting ready to hit the road again, the group of three riders arrived. Not sure when I passed them, not sure how I managed to be ahead of them but there they were. Next stage was 57km but my hotel was at the 37km mark. I made it to the hotel around 10:30 and my plan was to be sleeping around 23:15, get up at 5:00 after 5:45 hours of sleep, get a quick breakfast. That would put me in the road at 5:30 with an hour and a half to ride the 20k to the control that would close at 7:00. It was a bit of a gamble, I was expecting the wind to easy a bit in those early hours and being well recovered in the morning. But that didn't happen. First I had a terrible night. My stomach was upset, and I woke up four times trying to get that BigMac out of my body by any possible mean without any success. This certainly was the same stomach virus that took my wife and two daughters going to the toilet all week, now it was my turn. 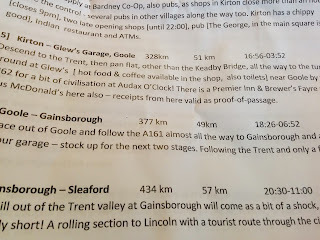 Having breakfast at the hotel (Red Lion Hotel in Epworth, excellent service) I met two other riders and we had a bit of a chat over breakfast. I was ready before them so I told them I was going to get moving because I knew I was going to be slow. And I was indeed. Some time later they passed me but I couldn't join them. Still I was never worried about not making the time cut at the control, I was too focused on managing how bad I was feeling, but when I made it to the control at 6:51 one of the two riders told me I had made it with only 4 minutes to spare. Looking now at the routesheet I see it was only 1 minute. The next stage (57km) was a nightmare, a coctel of weakness, upset stomack and a bit of head wind that kept me struggling and riding at less than 20km/h, that is dangerously slow for a 600. Still, and I don't know why or how, I didn't feel any stress about the time limits. I knew I was close but I was riding at the only pace I could sustain. By the time I made it to the control I was feeling a bit better but I was there with only 16 minutes to spare. That means I had ridden the last 57km at about 18km/h. I had a hot chocolate but ate nothing because my stomach would not tolerate it. I went back to the bike and when I was exiting the town I was stopped in a level crossing. From where I was I saw the train station a thought crossed my mind "I could just quit and get a train here". Luckily the train passed and I was moving before I could even give it a second thought. Next stage was 90k and it was still in the head wind and the chocolate didn't settle very well in my stomach and it started to rain and I was uncomfortable with the shorts I was using. In very few kilometres I had to stop three times. One to change the shorts to the ones I used the day before, two to get the rain coat on and three to try to throw up, I had come to the conclusion that would put my stomach at easy. I couldn't. But when I was about to start riding again the miracle happened. A group of five riders passed and the fifth one invited me to join them. That was Vincent, he even drop from the group to wait for me and offered his wheel to take me to the back of the group. They were riding at a decent pace and sitting at the back of the group I was able to keep up with them. I was rescued 60km before the control. Those were still 60 challenging kms but I knew this was saving my ride. They gave me conversation, they sheltered me from the wind and that gave me the opportunity to recover at bit. By the time we made it to the control (km434) I was hungry again and that was a good signal. Next and final stage was 90k with some "hills" in the last 30. I was feeling a bit better, I even managed to take a couple of (rather weak) turns in the front. By the time we hit the first "hills" I chosen my strategy, follow the pace of the girl that was riding in the group. She was among the fastest climbing, but what was important for me is she was riding steady, no surges and that is what I needed. You know how this things are, the moment you are 20km to go the adrenaline starts pumping and you feel excited and optimistic. With 15km to go we reached the point of I'm sure I'll finish (that point where even if you break your bike you could walk to the control and still make it in time). With 10 to go I recognized some of the "climbs" from LEL2013. And then suddenly the final control was there. It was exactly 20:30, I had finished the ride in 38 hours and 30 minutes, and hour and a half before the time limit. I thanked the five riders in my group for their help, I had ridden with them 150k and without their help I wouldn't make the time limit. The atmosphere at the pub that was hosting the final control was great, lots of riders enjoying the late afternoon sun and lots of animated conversations about PBP2015 but I didn't stay for long, I was getting cold and I wanted to get home as soon as possible. My stomach is still in bad shape today, ate a bit of rice at lunch and felt bad all afternoon, I'll have to give it a rest for a day or two if I want to be recovered for next weekend 600.